In other words, we can get from the earth to the planet by one of two different routes. The first route corresponds to the heliocentric model, and the second to the geocentric model. In the latter model, gives the displacement of the so-called guide-point, , from the earth. Since is also the displacement of the planet, , from the sun, , it is clear that executes a Keplerian orbit about the earth whose elements are the same as those of the orbit of the planet about the sun. The ellipse traced out by is termed the deferent. The vector gives the displacement of the planet from the guide-point. However, is also the displacement of the sun from the earth. Hence, it is clear that the planet, , executes a Keplerian orbit about the guide-point, , whose elements are the same as the sun's apparent orbit about the earth. The ellipse traced out by about is termed the epicycle. Figure 29: Heliocentric and geocentric models of the motion of a superior planet. Here, is the sun, the earth, and the planet. View is from the northern ecliptic pole. Figure 30: Planetary longitude model. View is from northern ecliptic pole. Figure 30 illustrates in more detail how the deferent-epicycle model is used to determine the ecliptic longitude of a superior planet. The planet orbits (counterclockwise) on a small Keplerian orbit about guide-point , which, in turn, orbits the earth, , (counterclockwise) on a large Keplerian orbit . As has already been mentioned, the small orbit is termed the epicycle, and the large orbit the deferent. Both orbits are assumed to lie in the plane of the ecliptic. This approximation does not introduce a large error into our calculations because the orbital inclinations of the visible planets to the ecliptic plane are all fairly small. 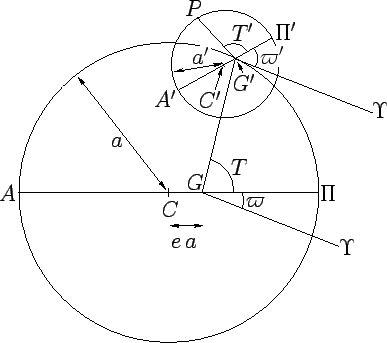 Let , , , , , , and denote the geometric center, apocenter (i.e., the point of furthest distance from the central object), pericenter (i.e., the point of closest approach to the central object), major radius, eccentricity, longitude of the pericenter, and true anomaly of the deferent, respectively. Let , , , , , , and denote the corresponding quantities for the epicycle. Figure 31: The triangle . This scheme allows us to avoid having to tabulate a two-dimensional function, whilst ensuring that the exact value of is obtained when , , or . The above interpolation scheme is very similar to that adopted by Ptolemy in the Almagest.